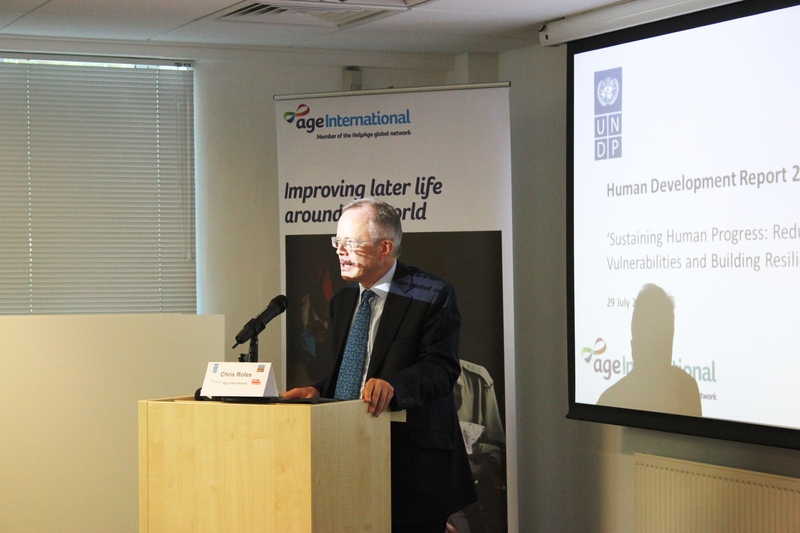 Age International has hosted the UK launch of the UN Human Development Report 2014 in London, as the UK affiliate of HelpAge International. The Human Development Report (HDR) is an annual report which measures human development across the globe and makes recommendations about furthering development across the globe. It’s published by the Human Development Report Office of the United Nations Development Programme (UNDP). This year, the report focuses on reducing vulnerabilities at different life stages, including older age. It calls for universal social protection and universal social services. Are some people being left behind? The report makes the case that successful human development relies on continuing to support people throughout their lives, with particular attention to ‘sensitive times’ such as during the transition to old age. Part of the report recognises that there are different types of vulnerability that a person will experience at different stages of his or her life. It also acknowledges the fact that people often have capabilities they are prevented from fully realising, in the face of obstacles that could be removed by policy or institutional changes. For example, the report states that social protection is often a factor in enabling households to continue sending children to school, and to access the necessary medical care. During the event, Baroness Sally Greengross said that longevity is ‘to be celebrated’ but that this is only possible if we tackle inequalities.